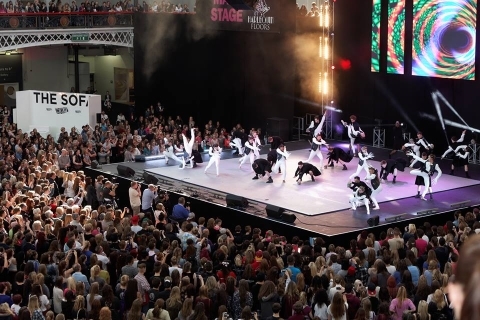 Move It, the bonanza that is the UK’s biggest dance event returned to ExCel in London’s Docklands in the middle of last month. From March 16-18, 20,000-plus dance professionals, educators, enthusiasts, and performers congregated in London’s Docklands, bringing the cavernous building alive with pulsing beats. It’s a celebration of all forms of dance, says SeeingDance’s Jessica Wilson. Move It houses anything and everything under one umbrella: performances and information stands by the big conservatoires and other vocational dance colleges, dancewear brands large and small, and everything in between. Foam rollers, shoes, costumes, leotards, dance floors, barres, it was all there. The show really does have something for everyone: dancer, teacher or spectator. Dance and fitness classes make up a large part of Move It’s agenda with a vast number programmed throughout the weekend. Hosting many classes are exhibitors throughout the show including ballet with the Royal Academy of Dance, contemporary with Studio 68, and musical theatre from Urdang Academy. The Main Stage was a colourful carnival of performances, largely from dance schools and training centres. With music more often than not thumping, from there and the Freestyle Stage and Move It Mash Up, it can all get rather intense. It’s not all loud and brash, though. Among this year’s performances was a new ballet pas de deux by former English National Ballet dancers Daniel Jones (who also taught some masterclasses) and his wife Kei Akahoshi, seen by SeeingDance’s Charlotte Kasner, rather appropriately to a pop song titled Mr and Mrs Jones. Daniel has had a busy and varied career since leaving English National Ballet, including establishing his own successful school and creating productions for his own dancers and as a freelance. Daniel and Kei are also busy parents, so it was a real treat to see them dancing, and in a quietly reflective piece amid the hype and razzle-dazzle of Move It. Both have a fluid style that creates a sensation of calm and effortlessness. Daniel’s line is glorious and he is an extremely considerate partner. Kei seems to have been born en pointe and be a creature of the air as she looks so comfortable in the strongly supported lifts. The duet is subtle. It may lack the flashiness of a standard gala pas de deux but is every bit as worthy of inclusion on any programme. Here at Move It the audience of mostly aspiring dancers, could not have had a better example of professionalism to follow. Let us hope that ‘Mr and Mrs Jones’ do not hang up their shoes any time soon. And, of course, that Move It will be back with us in 2019!